Toyota Kirloskar Motor (TKM) has announced the launch of next generation high performance “All New Camry Hybrid Electric Vehicle” in India. Inspired by The Toyota New Global Architecture (TNGA), the luxurious and powerful All-New Camry Hybrid Electric Vehicle or self-charging electric vehicle is built to provide a comfortable and stable ride with superior handling, thereby representing unmatched engineering, green solutions, superior technology, design and performance. The All New Camry Hybrid Electric Vehicle is powered by a 2.5-liter, 4-Cylinder Gasoline Hybrid Dynamic Force Engine offers a Max Output of 131kW (178 PS) @5,700rpm and Max Torque of 221 Nm(23kg-m) @3,600-5,200 rpm. Hybrid System Motor Generator delivers a Max Output of 88kW (120PS) and Max Torque of 204.1 Nm (21 kg-m). The new sedan also reflects Toyota’s philosophy of harmonizing a bold and distinctive new look that seamlessly melds athletic accents a sleek and modern shape giving the Camry Hybrid Electric Vehicle a bold and sophisticated look. While retaining the ethos and magnificence associated with the Camry legacy, the new Camry Hybrid Electric Vehicle or self-charging electric vehicle has retained current generation USP like rear seat comfort and significantly enhanced performance, design, luxury and ride comfort. Commenting on the launch, Masato Katsumata, Chief Engineer, Camry, Toyota Motor Corporation said, “The All-New Camry Hybrid Electric Vehicle represents a true definition of strikingly outstanding and class-leading automotive breakthrough. Our priority was to create a dynamic sedan that would exceed customer expectations for practicality, functionality and reliability while creating an emotional design that would further enhance customer delight has resulted in the creation of the All New Camry Hybrid Electric Vehicle under the concept of “Unprecedented Change”. The engineering team has taken the global sedan in an entirely new direction, transforming it into a sedan with aggressive, head-turning and sophisticated looks. Present at the launch Masakazu Yoshimura, Managing Director, Toyota Kirloskar Motor said, “At Toyota Kirloskar Motor, we are committed to create green solutions for tomorrow’s mobility. Globally we have been the pioneers in hybrid technology and this has been an important focus for us in a market like India which is moving towards greener, sustainable future. 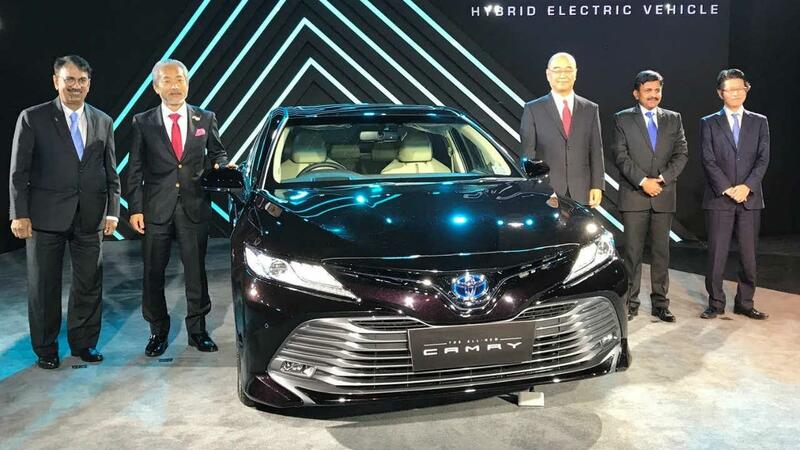 The launch of the All-New Camry Hybrid Electric Vehicle reinstates this focus and we are thankful to our customers in India for their phenomenal response which gave us the confidence to introduce this new and advanced model that promises seamless fun without compromising on its environmental credentials. Clearly, The Camry Hybrid Electric Vehicle reinforces our mission of developing Ever-Better Cars. Speaking on the new offering, N. Raja, Deputy Managing Director, Toyota Kirloskar Motor said “Toyota Camry proudly stand tall as one of the world’s most popular passenger cars, this enduring success globally as well as in India has encouraged us to introduce the enhanced All-New Camry Hybrid Electric Vehicle. We are certain that the unmatched advantages of hybrid technology, “fun-to-drive” characteristics and alluring styling on an equal footing with superlative build quality, reliability and safety will exceed customer experience. Above all, All-New Camry Hybrid Electric Vehicle is not only a class-leading comfort car, but anyone who drives this vehicle will feel confident with the level of driving performance and controllability provided alongside the quietness never occurred before thus reflecting our best efforts to exceed all customers' needs.” He further added. The new exteriors has also given the sedan a unique and stylish look. The attractive bold face characterized by Two Grill Design, New Moon Roof, Rear Combination Lamps Design, Stylish Front Grille, New Headlamp Design, LED Fog Lamp and sweeping lines has transformed it into a sedan with attractive and sophisticated looks. The physical manifestation is further enhanced by the solid 18-inch Multi-Spoke Alloy Wheels. The All New Camry Hybrid Electric Vehicle’s cabin is spacious, elegant and artistic, featuring upscale materials and artistic build quality. The new car’s cabin is accentuated with a range of advanced features which includes Best-in-class cockpit with Human Machine Interface (HMI): Rich Texture and finish, Enlarged Cargo Space, New Seat Design - Comfortable Rear Seats, Touch panel at Rear Arm Rest, HUD (Head-Up Display). Safety is a high priority at Toyota and a host of active and passive state-of-the-art safety systems and technologies will ensure safety for all passengers as well as pedestrians. The All New Camry Hybrid Electric Vehicle or self-charging electric vehicle is equipped with best in class 9 SRS Airbags, Anti-Lock Braking System with Electronic Brake-force Distribution and Brake Assist, Vehicle Stability Control and Traction Control (with Off Switch), ISOFIX and Top Tether Anchor for Child Seats amongst host of other world-class features. The All New Camry Hybrid Electric Vehicle or self-charging electric vehicle is available in Silver Metallic, Attitude Black and Phantom Brown along with four new exciting colors like Platinum White Pearl, Graphite Metallic, Red Mica and Burning Black. Interiors also comes with luxurious Beige color and futuristic Onyx Garnish, Metallic Accents, Soft Upholstery reflecting advanced and premium impression. *Prices will be same across the country at ex-showroom level, however final on road price may vary based on local road tax and levies.